His 2018-19 season includes appearances with the Kansas City, Ann Arbor, Illinois, Spokane, Bangor, Augusta, and Pensacola Symphony Orchestras, as well as a performance of Beethoven’s Emperor Concerto on fortepiano with Mercury Houston. He will play in Mexico with the Xalapa Symphony Bernstein’s "Age of Anxiety” to celebrate the composer’s centennial, and perform the New Year’s concert with the Beijing symphony in China. He will also perform recitals and chamber music, including tours with the Goldstein-Peled-Fiterstein Trio, the Tempest Trio, and the Fine Arts Quartet at the Mendelssohn International festival in Hamburg Germany, as well as in Cleveland, Washington DC, New York, Burlington, Key West, Sarasota, Melbourne, Duluth, and other cities. This season will also include a CD release of Mozart Piano Concerti Nos. 23 and 24 with the Fine Arts Quartet (a follow-up to their critically acclaimed recording of Nos. 20 and 21) and Scarlatti Piano Sonatas on the Naxos label. 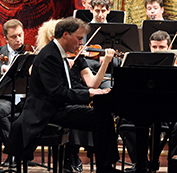 His 2017-18 season included appearances with the Indianapolis Symphony as part of a Prokofiev Festival performing the composer's Piano concerti nos.1&4. He also played Bernstein’s "Age of Anxiety" with the Jerusalem Symphony. He returned to the prestigious Gilmore festival and appeared with the Rhode Island Philharmonic, Cincinnati Chamber orchestra, Haifa Symphony and Xalapa Symphony among others. Recitals and chamber music performances included Interlochen, the Bach Festival in Winter Park, Mozart concertos with the Fine Arts Quartet and tour with the Goldstein-Peled-Fiterstein Trio, as well as The Tempest Trio. He also released a new CD on Naxos - Dvorak Piano Trios vol. 2 with his Tempest Trio. The past few seasons included a 17-concert Latin American tour with the Israel Chamber Orchestra including concerts at Teatro Colón in Buenos Aires, Teatro de Bellas Arts in Mexico city, Teatro Nacional in San Jose, Teatro Solis in Montevideo etc. Other highlights included an appearance as soloist with the Chicago Symphony at Ravinia, and at the prestigious Ruhr Piano Festival in Germany performing Mozart, Britten and Poulenc in one evening with Leon Fleisher, his former teacher, conducting. 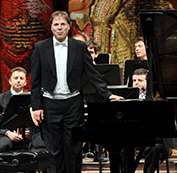 Among many memorable recent experiences was the premiere Lost Souls with the Kansas City Symphony and Michael Stern written for him by the noted Israeli composer Avner Dorman; debut with the London Philharmonic Orchestra and Vladimir Jurowski, the Hungarian National orchestra, the Orquesta Sinfonica Nacional de Costa Rica and the "George Enescu” Philharmonic in Bucharest. He was also heard in Paris with the Orchestre Philharmonique de Radio France, and made his Carnegie Hall debut in the Mozart Triple, as well giving the world premiere of a concerto by Mark Kopytman with the Jerusalem Camerata Orchestra. 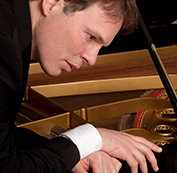 A passionate advocate for music education, his recent teaching engagements have included the Steans Institute of the Ravinia Festival, International Keyboard Festival and Institute in New York, Music@Menlo, Piano Texas, PYPA in Curtis, International Piano Festival in Gijon Spain, and "Tel Hai” masterclasses in Israel. Mr. Goldstein serves as the Artistic Director for The Distinguished Artists Concert & Lecture Series in Santa Cruz, CA and was recently named the Artistic Director of the Mt. Angel Abbey Bach Festival in Oregon, starting in 2019. He created the Emerald Coast Music Alliance, whose annual festival in Florida is devoted to sharing the beauty of classical music to under-served communities, free of charge. He graduated from the Peabody Conservatory of Music studying with Leon Fleisher and received scholarships from the America Israel Cultural Foundation. Following his graduation he became a "Performer Fellow” at the Guildhall School of Music and Drama in London where he initiated chamber music concerts involving staff and students, as well as an annual festival dedicated to the piano duet repertoire. He was an artist in residence at the "Theo Lieven” piano academy in Como Italy. He was recently named "Distinguished Visiting Professor” at the University of Missouri - Kansas City. To read management's version please click here.